This book is definitely unlike anything I have read before. 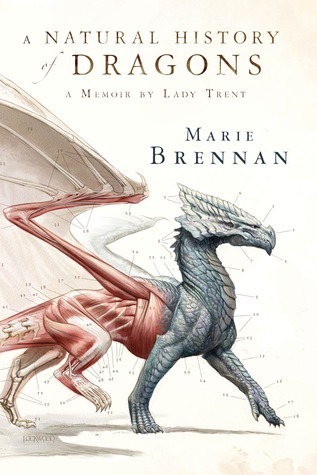 It bills itself as a memoir, and it truly is - the fictional memoir of Isabella, Lady Trent, and her first encounters with dragons, which have been a life-long fascination of hers. The entire book is written in Isabella's voice as she talks about her childhood, meeting her husband, and their perilous journey to study dragons, at a time where women, especially women of high society, weren't encouraged to engage in scholarly pursuits. This is a book about dragons, yet, but first and foremost, it is a story about a young woman bucking tradition in order to follow her passions. I think that's an important point to make and remember, because if you go into this book expecting it to be high fantasy about dragons, you'll be disappointed. There is plenty of adventure, and danger, and of course, many encounters with dragons, but there are also long passages about society's expectations of women, or about Isabella's thoughts and reflections on her various experiences. I don't want to say that the story is dry, but rather that it isn't always fast-paced. I did, however, really enjoy the book. Reading something that's actually written in the style of a memoir was different, and made the book really feel like it was part of a much larger universe. I found myself really wanting to read the other books that Isabella talks about in her narration, both books which shaped her love of dragons and her own writings which had been previously "published". Also, I can't help but want to read future "memoirs" about Isabella. This book only covers her early life, so I was left with questions about how she managed to defy society's expectations in order to become a respected scholar, or how she got the title of Lady Trent. You don't get a complete picture of Isabella, rather you get a much older Isabella's reflections on her younger self. And in case you haven't gathered already, Isabella is a real firecracker of a character -- she certainly knows how to play the game and fit into what society expects of her, but when it comes down to it, she also quietly yearns to challenge those expectations. I also need to mention the absolutely stunning illustrations that are found in the book, by the artist Todd Lockwood. You can preview a few of them in our recent spotlight on the book. I would absolutely recommend this to anyone who likes the idea of fantasy novels, but who also is a fan of stories set more in a Victorian time period. While this book doesn't take place in "our" world, it's clearly styled after that sort of era. The book is overall a clean read, with some scenes of violence, both by dragons and by humans. And don't forget, there's still time to enter to win one of two finished copies of the book, thanks to Tor! Open to addresses in the US and Canada. "of how she sought true love and happiness despite her lamentable eccentricities"
"a young woman bucking tradition in order to follow her passions. " "passages about society's expectations of women, or about Isabella's thoughts and reflections on her various experiences. " "a much older Isabella's reflections on her younger self." "Isabella is a real firecracker of a character -- she certainly knows how to play the game and fit into what society expects of her, but when it comes down to it, she also quietly yearns to challenge those expectations. " "fan of stories set more in a Victorian time period. While this book doesn't take place in "our" world, it's clearly styled after that sort of era. " All these points you mentioned, plus the illustrations and my love for dragons made need, crave for and desire to win this book so much I want this to happy here!